Los Angeles area transit officials celebrated 20 years of urban rail at a Staples Center event on July 23. Over the past 20 years, Los Angeles has opened 2 metro (subway) lines, 4 light rail lines and two exclusive busways (though apparently busways aren't worth celebrating). 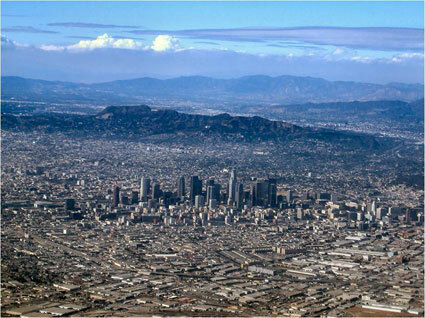 Surely, there is no question but that Los Angeles has been successful in opening a lot of new transit infrastructure. At the same time, however, The Los Angeles Times reported that Professor James Moore of the University of Southern California, blames the disproportionate financial attention paid to rail projects reduced transit ridership by 1.5 billion (with a "b") over the same period. The reason is, as Tom Rubin put it, is that many more people can be carried for the same money on buses, "Had they run a lot of buses at low fares, they could have doubled the number of riders." Rubin was chief financial officer of the Southern California Rapid Transit District, one of the two predecessors of the present transit agency (MTA). The other was the Los Angeles County Transportation Commission, to which I was appointed to three terms. Transportation experts were also quoted to the effect that the rail system has done little to reduce traffic congestion or increase the use of mass transit much beyond the level in 1985, when planning for the Metro Blue Line began. Indeed. Traffic congestion has gotten much worse, and traffic volumes have increased materially. Our recent article showed that transit market shares had declined. These results are in stark contrast to Houston, which in 1984 had the worst traffic congestion in the nation. Houston set about to solve the problem by expanding its roadway capacity. 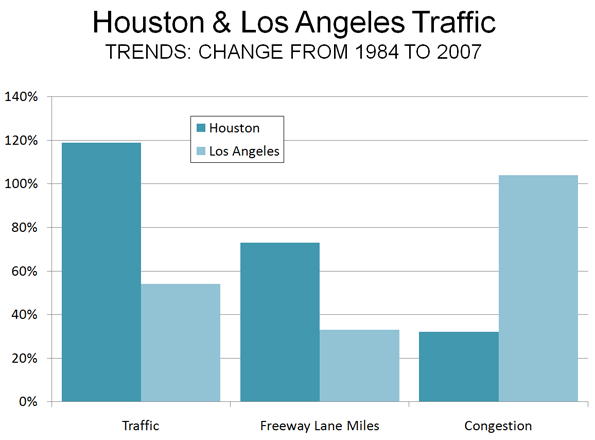 Since 1984, Houston's traffic grew twice as fast as that of Los Angeles, and population grew three times as fast (at least in part because many Californians were moving to Texas). Houston also added freeway mileage at double the percentage rate of Los Angeles. The reward was an increase in traffic congestion less than one-third that of Los Angeles (Figure). The most recent INRIX Scorecard shows Los Angeles traffic congestion to be more than 2.5 times as intense as Houston's. Spending money on the right things makes a big difference. One can only wonder how different things might have been if Los Angeles had invested in the capacity people need (more roads) rather than in politically correct transit facilities that have no potential to reduce traffic congestion or to improve mobility and economic performance. There is a lesson from Los Angeles experience both for other areas and other government functions. The test of government performance is outputs, not inputs. Thus, it is appropriate to celebrate large transit market share increases or significant improvements in student achievement, not how many miles of rail are built or how much money is spent on education. Submitted by zion1122 on Thu, 08/22/2013 - 08:53. Submitted by zion1122 on Thu, 08/22/2013 - 06:59. Submitted by zion1122 on Wed, 08/21/2013 - 06:33. Submitted by robert1122 on Thu, 08/08/2013 - 04:19. Submitted by jikabourne on Sun, 01/13/2013 - 07:42. Submitted by misbaharman on Mon, 12/31/2012 - 07:22. Some of what I have written about is state-of-the-art, and you might not even find it on the usual pro-tech or transhumanist websites like kurzweilai.net, hplusmagazine.com or acceler8or.com. e.g. I recently wrote about unsupervised semantic parsing (and indirectly about unsupervised ontology induction), which is a BIG BIG DEAL in A.I. research... but is not exactly the sort of thing you will see discussed on kurzweilai.net, for instance. Submitted by tylervjohnson on Tue, 08/03/2010 - 12:39. I actually like riding on rail transit when it's convenient, but the problem is that most rail transit systems in this nation are not. They are stuck in the one-size-fits-all model of funneling traffic into the city center, despite the fact that for decades now, business and industry increasingly locate in suburbs and exurbs. Quite frankly, people will use the transportation that they deem cheapest, most convenient, and fastest. In most cases, braving traffic for a 45 minute commute is still faster than putting yourself at the mercy of transit schedules and taking twice as long to get there. Perhaps if transit advocates rejected the similarly outmoded model of all government control all the time and allowed for competition in transit provision, somebody could build a rail/transit system that actually made money and delivered people to their destination efficiently. Submitted by prudd on Thu, 07/29/2010 - 17:01. We can't just build transit and expect it to work. We have been financing and subsidizing car based development for generations. These subsidies need to be defunded in order for public transit to work. For instance, in your article you say that buses can move people cheaper than rail. I'm willing to bet you didn't factor in the cost of the roads that the buses rely on, where you did include the cost of the rail in the transit system calculation. That's apples to oranges. Rail is expensive up front, but much cheaper in the long run, if you properly compare transit costs to the incredibly expensive cost of car based transportation, per capita. It moves more people for less money. No debate. Submitted by PhilBest on Thu, 07/29/2010 - 21:11. Prudd, it didn't work for the Communist bloc, and it won't work anywhere. The problem is the benefit-cost ratio at the margins, for road based transport and rail based transport. Connect up a new road, and benefit-cost is positive; and we have never got anywhere near the point at which we have so many roads that this equation goes negative. But connect up new railway lines to provide anything like the mobility that roads and autos do, and the benefit-cost is negative very very early in the piece, and only gets worse. Externalities apply to the whole, not just the margins. The negative externalities of the roads and autos system, are far outweighed by the positive externalities, the main one of which is the contribution of auto-mobility to the viability of the whole modern economy. It is typical woolly, biased thinking, to do idealistic comparisons that have no resemblance to the real world, to "prove" the case for transit. Like, 500 people on a train travelling 50 miles, compared to 500 people each in 1 car, each travelling 50 miles. Enviro activists do it all the time. The real world simply bears no resemblance to this comparison. Read Alain Bertaud's "The Costs of Utopia" to understand why the planned cities of the USSR actually consumed far more resources per unit of production than the free market, "automobility" cities of the rest of the world. The trouble mostly is that enviro activists lack the intelligence to grasp the complexities of reality. Submitted by rich_b on Fri, 07/30/2010 - 13:35.
in most areas the only way rail "works"is commuter traffic to a central area. But even then its still subsidized by other taxpayers, I know of no transit system that is self supporting. Car travel on roads would be covered by the present gas taxes if the money would not be stolen to do other things with it. The case of my area the only "central" area is downtown Chicago, which is in the next state. NW Indiana is not centralized and never was. So taxpayers are subsidizing the few thousand that go by train to Chicago to work. Transit is not terribly useful to anyone traveling inside NW Indiana. Most people don't want to live in a urban environment so roads should be the priority due to the FACT that MOST people use them. Less then 1 percent of Americans use public transit on a regular basis, less then 5 percent have EVER set foot on public transit. But yet 25 percent of the federal transportation budget goes to transit. And they are mad they don't get more. I think the wrong group is mad about funding, it should be the 99 percent of people who drive. Its time for the "good-doers" to stop screwing the public in their dreams of utopia and do what the people want for once. The general public is tired of a small group of people who think they know better then the rest of us, and think they should change a world that isn't that screwed up.